The NY Times reported today that online sales are up 15% this holiday season. More shoppers are turning to the web to fill Christmas shopping needs with clothing leading the way at over 25%. While online purchases represent a small percentage of retail sales; they represent a growing percentage. Overall retail sales will be up something like 3.3%. So what does that mean for Brick and Mortar? The bad news is that commercial mortgage delinquencies are way up. 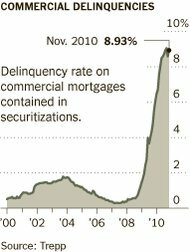 Even though the price of securitized commercial mortgages has also gone way up. Then there is the fact that such mortgages are almost always nonrecourse, meaning the lender can seize the property but has no claim on other assets of the owner. Moreover, many commercial properties have extremely restricted uses, limiting the number of people interested in a troubled property. That can give borrowers power that homeowners can only dream of when negotiating with their mortgage holders. Last week a $171 million loan on a shopping mall in Virginia was sold for $115 million. Trepp reports that will wipe out some classes of two securitizations that owned the loans, and provide payouts for others. The buyer of the loan was Vornado Realty Trust, which owns the mall. In effect, it was allowed to pay off the loan at a large discount to face value. With declining demand for retail space as a result of the growth in onlone retailing; and the contining weakness in the economy will there be another dip in commercial properties?